With the volume, velocity and value of data accelerating at an ever-increasing pace, making a departure from the costly and complex approach to storage of the past is critical. Dell, the #1 supplier of entry and mid-range storage, delivers new workload-optimized architectures that simplify IT for any size enterprise. 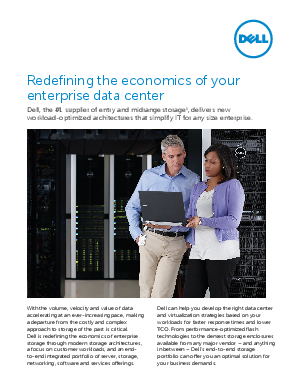 Read this white paper to learn how Dell Compellent powered by Intel® Xeon® processors can reduce your total storage software costs up to 96% and your total hardware costs up to 44% compared to traditional storage over a ten-year period.